Second, this downtick in home high-speed adoption has taken place at the same time there has been an increase in “smartphone-only” adults – those who own a smartphone that they can use to access the internet, but do not have traditional broadband service at home. Today smartphone adoption has reached parity with home broadband adoption (68% of Americans now report that they own a smartphone), and 13% of Americans are “smartphone-only” – up from 8% in 2013. Some of the most significant changes in these adoption patterns are taking place among African Americans, those with relatively low household incomes and those living in rural areas. Third, 15% of American adults report they have become “cord cutters” – meaning they have abandoned paid cable or satellite television service. Many of these cord cutters say that the availability of televised content from the internet and other sources is a factor in their move away from subscription television services. At one level, the picture in these new data can be viewed benignly by those who are concerned about connectivity and digital divides. Overall, “advanced internet access” – that is, those with either a smartphone or a home broadband subscription – has changed little since 2013. Some 80% of adults have either a smartphone or a home broadband subscription in 2015, compared with 78% who said this in 2013. Still, the fact that more Americans have only a smartphone for online access at home has consequences for how people get information. Those who are “smartphone-dependent” for access do encounter distinct challenges. Previous Pew Research Center findings show that they are more likely than other users to run up against data-cap limits that often accompany smartphone service plans. They also more frequently have to cancel or suspend service due to financial constraints. Additionally, a recent Pew Research Center survey found that those who use digital tools for job searches face challenges when it comes to key tasks such as filling out job applications and writing cover letters. In general, when given a choice, people prefer to use their smartphone for getting in touch with family or friends but, for watching video, they prefer a device with a larger screen that uses a home broadband connection. At the same time, many “smartphone-only” users say that the reason they do not have broadband at home is because their smartphone lets them do all they need to do online, underscoring the device’s utility for those without a home high-speed subscription. Roughly two-thirds (69%) of Americans indicate that not having a home high-speed internet connection would be a major disadvantage to finding a job, getting health information or accessing other key information – up from 56% who said this in 2010. Among non-broadband adopters, 33% cite the monthly cost of service as the main reason they lack broadband at home, with an additional 10% citing the cost of a computer as their main reason for not having broadband service. These changes are related: Non-broadband adopters who view a lack of home service as a major disadvantage are also more likely to cite the monthly cost of broadband as the primary reason they do not subscribe. Price sensitivity, in other words, is greatest among those who are most likely to see the advantages of a home broadband subscription. 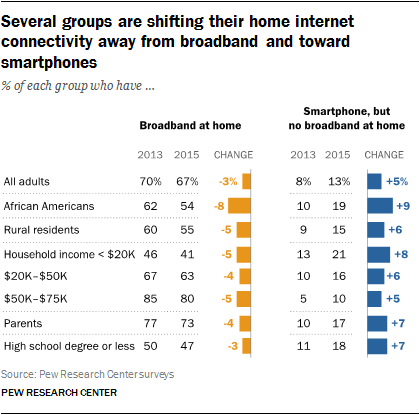 In 2010 and 2015, Pew Research Center asked Americans whether they thought being without a home broadband connection was a major disadvantage in several different topical areas. There has been a substantial increase over that period in the share of adults who say that not having a home high-speed connection is a major disadvantage when looking for job opportunities, accessing government information and in other areas. 40% of non-high speed users say that being without broadband is a major disadvantage for learning about or accessing government services, compared with 25% who said this in 2010. 37% say that lacking broadband at home is a major disadvantage for learning new things that might enrich their lives, up from 23% in 2010. The changes in home broadband and smartphone connectivity are not the only shifting trends in connectivity among Americans. Some 15% of adults now qualify as “cord cutters” – meaning they once had either cable or satellite TV but no longer do. Another 9% never had either cable or satellite service. Young adults are the most likely cord cutters; 19% of adults between the ages of 18 and 29 have severed the ties that they once had with cable or satellite service. Another 16% of young adults say they have never had pay TV in the first place. Affordability is a main driver for those without cable or satellite, as is the ability to view the content they want to watch somewhere else. Some 71% of those without cable or satellite say they lack these services in part because the cost is too expensive, while 64% say they can access the content they want using an over-air antenna, on the internet or using streaming services. 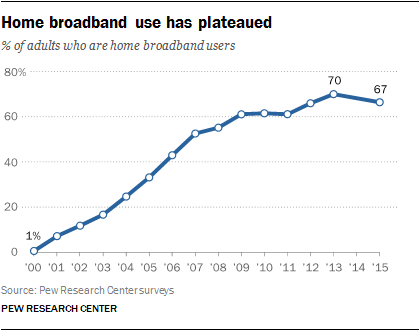 Large numbers of non-broadband households have never had home high-speed service in the past, and few have interest in subscribing in the future. Overall, 33% of American adults do not have broadband at home. Within this group of non-adopters, 36% had a subscription in the past, while 59% say they have never had a broadband subscription plan at home. In addition, just 25% of non-adopters are interested in subscribing to broadband service in the future, while 70% say they are not interested in doing so. The upshot is that, looking across the 33% of adults who are non-adopters of home broadband, nearly half (46%) seem unlikely to purchase home broadband service any time soon, in that that they have never had broadband in the past and also say that they are not interested in getting service in the future. Among non-adopters, price sensitivity – where the monthly cost of service is the chief barrier to adoption – is most prominent among those who have had service in the past, and/or are interested in getting it in the future. Some 40% of non-adopters who have had service in the past, or are interested in subscribing in the future, say the monthly cost of a subscription is the most important reason they lack service currently. On the other hand, 25% of those who are “hard-to-reach” – meaning they have never had broadband service and express no interest in having it in the future – say price is the most important barrier to adoption. Most of the material in this report – specifically the findings on barriers to broadband adoption, how people view lack of broadband as a disadvantage, and cord cutting – is based on a national telephone survey of 2,001 Americans ages 18 and older conducted between June 10 and July 12, 2015. Comparison of 2013 and 2015 results for broadband and “smartphone-only” adoption are based on a September 2013 survey of 6,010 adults and a combined analysis of surveys conducted March 17-April 12, 2015 (1,934 adult respondents); June 10-July 12, 2015 (2,001 respondents); and October 13 -November 15, 2015 (2,752 respondents), for a total of 6,687 respondents cases for analysis.